Located off of one of the busiest street in Baton Rouge, you will find Bluebonnet Swamp. It was a nice morning for a walk. Or, laying in the sun. Stay on the path – their are critters larking in the swamp. Beware of touching plants – it could be poison ivy. Wear insect repellant – because the unofficial bird of Louisiana in the mosquito. I looked up the dimensions for Dominoes; design the dominoes; and created the case to look like a domino. His own personalized dominoes. I also printed a set for my dad for Father’s Day with his last name on them. On Easter Sunday in 1970, the Baton Rouge Zoo first opened to the public. A lot of credit is due to Bill Black, a.k.a Buckskin Bill, who was a popular children’s TV host. He would end his program everyday saying “Baton Rouge needs a zoo.” He encourage children to collect pennies and donate them so the Zoo could purchase an elephant. The children would line up outside the studio to donate the pennies they collected. The campaign was so successful, the children collected enough money to buy two elephants. One of the elephants was named Penny. There are currently no elephants at the zoo. When one of the last two died, the other was ship off to another zoo so it would not be lonely. The zoo is located in Louisiana, so of course, there are alligators. This alligator look big and mean enough to go through the fence if he was hungry. The trip to the zoo was worth it, just to get this picture. I caught these birds doing… well I will give you a hint. They are in a nest. This little one decided to pose for me while I was standing there. It a very pretty area. A nice area to walk around, or take the train. 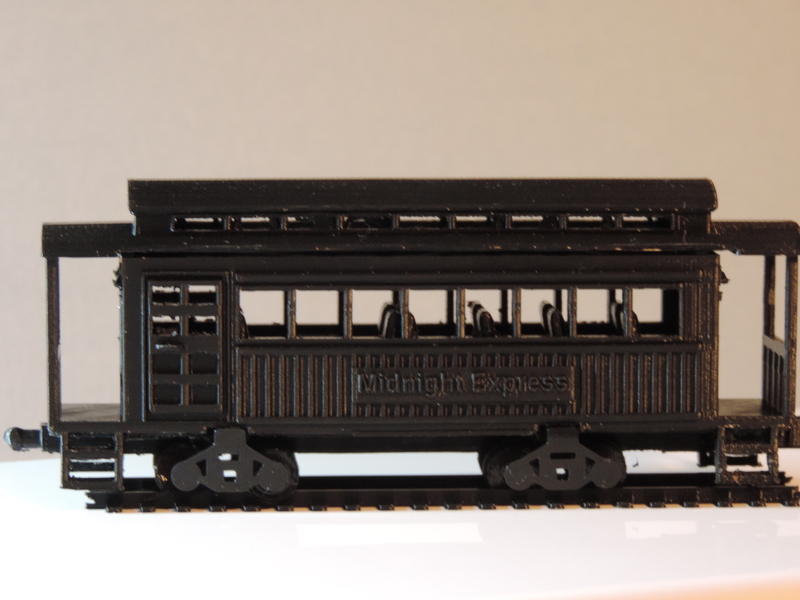 This is the Passenger Car in my Train Series. The wheel assemble was printed with the side shown on printer plate, which provided for the smooth finish. I designed little lanterns and put them by the door on both ends of the car. I designed the seating without the arm rails because I believed it may have been too delicate to provide a good result. The train is now longer then the white cutter where I took the previous pictures. Soon, it will be too long for the shelf it is sitting on. But, the wheels are spinning and the locking devices are functioning. I made the Passenger Car slightly longer than the Caboose. The extra width was due to the roof over hang. My 3D printed house. It was fun to design and a challenge to print. Instead of printing it in six sections, the next time I believe I will be printing it in four sections and if I want it in multiple colors, I will paint it.. The six sections were; foundation, 1st floor, balcony, 2nd floor, roof, and roof siding. The roof siding fit into it designed location without much effort. The next house I will print on normal print vs. fast print. Even if the sections take 11 hours each or more to print. With the details in the house, I believe it is needed. I do not know why the corner next to the steps appears to be melted. 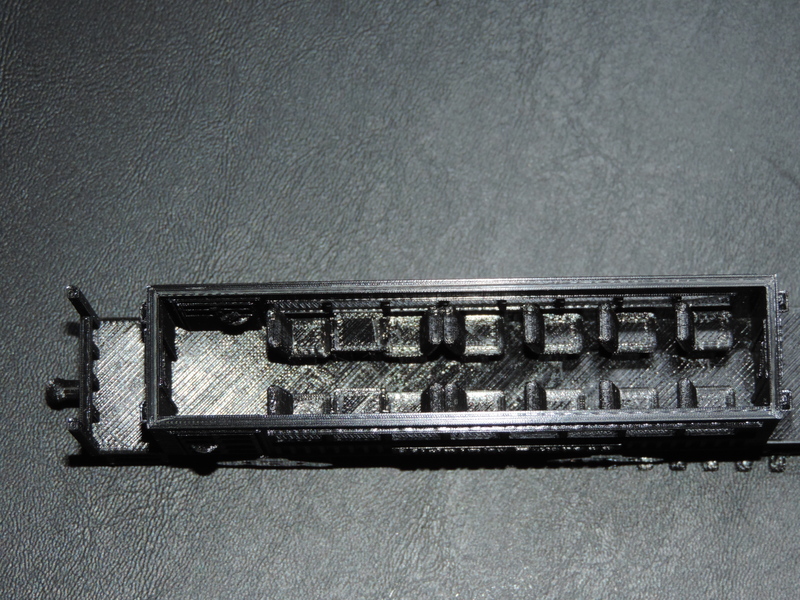 Maybe some oils from my fingers were on the build plate that prevented proper adhesion. The roof came out great. And, the railing printed nicely. Whoops, it looks like I didn’t remove some of railing structure before taking the pictures. The house was designed using Tinkercad.com; link Two Story House. 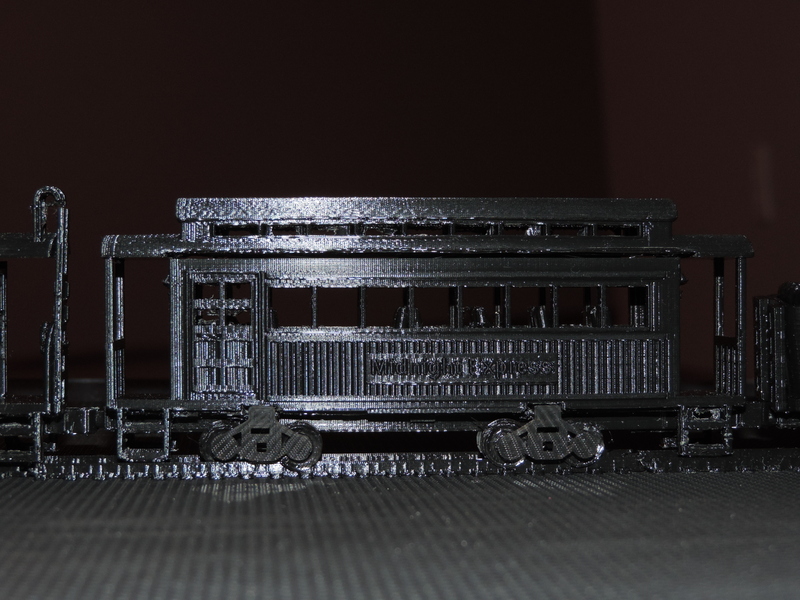 One of my projects in the 3D Printing world is to design and print a train; Train Engine, Coal Car, Passenger Car, Cargo Car, etc. I am not particularly into trains, but I thought it would be a fun project. I’ve based the size of the train after Gn15 Model Train scale. It specifies a train track gauge of 16.5 mm. Only two of the cars have been completely designed and just finished printing the Train Engine, after several false starts. The train is not a copy of any one train. I used components I liked from many trains and incorporated them into the design. A colored version of the Train Engine can be viewed on Tinkercad link: Train Engine. Minor modifications where made for a successful print of the train. The train was printed using supports (everywhere settings). The carefully removal of the supports took time. The wheels of the train were printed separately because I wanted them to be able to spin. I even put chairs and gauges in the car to give the train character. The grid on the platform was not part of the designed. It was remnants of the support structure. Instead of smoothing it out, I thought is provided a nice effect. 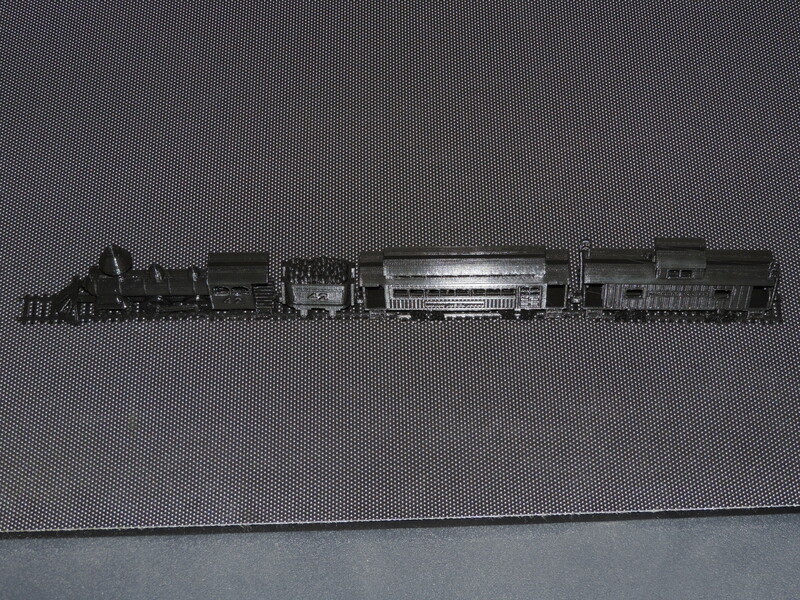 Once I completed the entire train, I will make the .STL files available on youmagine.com. Tinkercad.com deserves created for provide me the resources to create! I have printed everything that was on the SD Card that came with the printer. The next step is downloading and installing the Cura software. To my disappointment, the Cura software does not let you design 3D objects. It does lets you render the object for 3D printing. In Cura, there is a link “YM” to Youmagine.com that allows you to share the objects you create. If also lets you download objects created by other individuals. That is where I found this robot. Named Makey Robot by le FabShop. Yes! He does have movable parts. There was no assembly required. After it was printed, I could move most of the parts. I having problems moving one of it’s ankle and knee parts. Only the 65 piece model was printed. The search is on for 3D design software. If you have any favorite, let me know. As I mention in the previous posting, the first couple attempts on printing the Ultimaker Robot, did not go well until I figured the filament grinding issue. The printing of this little guy when smoothly. After the print is done, it is necessary for the printer to cool. I have learned that even after the printer has indicated it has cooled down, if you let the object sit there longer, it is easier to remove.